Whew! It's been almost a month since my last post. I've realized if I want to have a craft blog I need crafty projects which aren't so labor intensive. I suspect this might be why "doll" quilts have become so popular as of late. 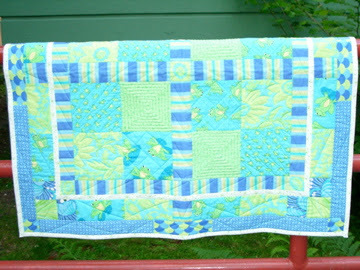 I just finished this quilt for my friend's baby boy. I had intended this gift to be for him when he was born. As it turned out, he was one month early (I hadn't even started it yet) and then some family circumstances put all my craft projects on hold for a few months. Tonight I am delivering the quilt 1 year, 2 months and 23 days late. Luckily my friend Vicky is very understanding. I used a combination of Amy Butler fabrics mixed in with some cute frog prints that I found on eBay. I was so happy to discover the colours were a perfect match of greens and blues. As I don't have a machine that does free motion stitching I had to improvise with stitches I could manage with my regular sewing machine. I think the stitches turned out ok but I can't wait for the day I get my own Bernina quilting machine!